A martyr from the Dachau concentration camp has been beatified -- and Pope Benedict has entrusted to him, and all the martyrs of concentration camps, the cause for peace. Speaking at his Sunday Angelus, the Holy Father gave thanks for the "heroic witness" of Fr. Alois Andritzki. 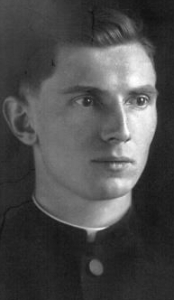 The 28-year old priest was accused by the Nazis of "hostile statements" and confined to the Dachau concentration camp. Catholic News Service writes: In 1943, "after more than a year in the camp, sick with typhoid, he asked a guard if he could receive Communion. Instead, they gave him a lethal injection." On this day of Pentecost, I would like to entrust to their intercession the cause of peace in the world. May the Holy Spirit inspire courageous proposals for peace and support the effort to advance it, that dialogue might prevail over arms and respect for man's dignity overcome party interests. May the Spirit, who is the bond of communion, rectify hearts twisted by egoism and help the human family to rediscover and carefully safeguard its fundamental unity. The prefect of the Congregation for Saints' Causes, Cardinal Angelo Amato, celebrated the beatification Mass of Fr. Alois Andritzki today in Dresden.